With a strong legacy of helping Indian men experiment with and manage their facial hair, Philips India is now ready to help Indian men manage the hair on the rest of their body. Together with brand ambassador Arjun Kapoor, Philips India introduced a new product category within this business – Philips Bodygrooming range - which will help get rid of unwanted body hair that often come in the way of self confidence, stylish apparel and intimacy! The concerns of excessive body hair will now be a thing of the past, as Philips Bodygroomers can go clear the jungles where no razor should go. Philips Male Grooming business offers a wide range of electronic devices for trimming, shaving and grooming. Philips believes in the trend of casual and DIY (Do It Yourself) styling, therefore Philips has brought the new Bodygroomers to address the needs of contemporary Indian men. The Philips Bodygrooming range has been designed to suit the Indian male skin and smoothly help them get rid of body hair in a painless and skin-friendly manner! 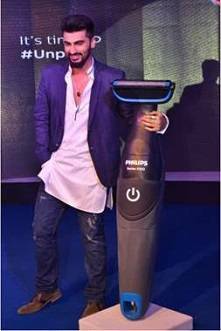 Arjun Kapoor, brand ambassador and one of the most stylish youth icons in the country, launched the new Philips range designed to groom the full body – Philips Bodygroom series 1000, which will solve all the grooming concerns a man may have! Be it your regular grooming routine for chest and arms or anything south, the Philips Bodygroom series 1000 is well equipped to handle all. These nifty, compact tools come with a bidirectional trimmer which provides as close a trim as 0.5mm. With a unique skin protector, which makes it painless and safe for sensitive areas. The Philips Bodygroomers are ergonomic, waterproof & shower-proof, available in cool colours and battery operated which make them super easy to use! Philips is set to make grooming oneself an almost effortless activity, with fruitful results! “We have relied on consumer insights and in-depth study of market requirements to design these products, to drive growth in the Indian markets. We have created many categories in Philips Personal Care that have grown successfully in short span of time- Philips Trimmers, Electric Shavers and Depilation for women. The category growth is a testimony to the effective and quick results which only electronic gadgets offer and Philips is a pioneer in these innovations,” he adds. There has been a significant shift in the way women want their men to look and men as a collective being more open and accepting towards such changes. Grooming is indeed booming and is going south – quite literally! Bodygrooming is the need of the hour – the women agree, and insist! Findings of the recent Philips StyleScape Survey revealed that Excessive body hair is a resounding NO for the woman of today, with 65% women admitting that they prefer a well-groomed man, and a whopping 72% of the respondents clearly stating that they only like men with well-groomed chest hair. Philips is taking the style revolution, in the country, to next level by bringing technologically advanced and cool toys for boys, designed to meet the core purpose – DIY grooming and styling; putting the power of self expression in the hands of youth. Bodygroom series 1000 is available in 3 variants with a price range starting from INR 1295 to INR 1495 and will be available across traditional and modern retail outlets as well as leading e-retail portals. Arjun Kapoor: Varun’s an attention seeker, takes off his shirt to stay in focus! Arjun gets a taste of the keeda in Khatron Ke Khiladi! SAB ventures into Ad film production Flying Machine starring Arjun Kapoor. JiffStore raises undisclosed round from Unitus Seed Fund & Times Internet!